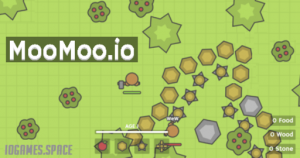 MooMoo.io is a massively multiplayer real time strategy game where players start out by gathering resources to establish a village. Set up a base, grow it and defend it from other players, all while plotting to become the strongest in the land. Build bigger bases to gain more gold and keep your opponents from doing the same by destroying their Windmills. The last one standing wins! Enter your desired Name and click on Enter Game. You can change the Server Region you’ll be landing in, i.e., Singapore, Miami, Silicon Valley, Frankfurt or London, select a Color, enable Native Resolution and Show Ping before starting. The Controls are outlined as well. Basic moves include the WASD keys, the mouse cursor, the E key and the Space Bar to Gather or Attack. Gather Wood, Food and Stones to build your village. Lay down the Windmill to start generating gold or establish defensive walls using the materials you have on hand. You’ll have to protect yourself from wild animals such as Bulls and Wolves as you explore the terrain. You also advance in Age as you perform actions, unlocking better tools and weapons that can be found at the top part of the screen. The moment your avatar appears on-screen, find a safe place where there are no hostile players. If you can secure a sanctuary that has the 3 main resources close by, great. Being aggressive won’t get you anywhere, as it’s better to set a wall and gather resources than to fight. You can play smart by resetting the game if there’s already a huge base when you begin. Don’t focus on gathering one resource, i.e., wood, stone or food as most buildings will require two to be completed. A good number for rotating resource collection is somewhere around 40, which means whenever you’ve collected 40 wood, then it’s time to gather stone, then food, etc. Also, keep in mind that Windmills require 50 wood and 40 stones, and each one generates gold for Ranking, purchasing Hats, Accessories and more. Each second you play MooMoo.io should be working towards something, whether it’s building up a suitable defense, collecting resources or advancing in Age. Concentrating on Gold without setting up some kind of defense will put you in a losing position. If you’re planning to raid an opponent, don’t go without collecting sufficient food. Your choice when advancing in Age should complement your goal. Get faster Windmills if you plan on staying put and generating gold or invest in a Great Hammer if you want to destroy enemy Windmills and wreak havoc on other players. Want To Start With More Resources? Gain an advantage right from the start by clicking on any of the promotional links at the lower left side of the screen. You can follow on YouTube and Tweet or follow on Twitter to get extra resource boosts, which will prove to be handy, especially if you’re aiming for the top of the Leaderboard rankings.